Sponsored by the McGrath Institute for Church Life’s Office of Human Dignity and Life Initiatives, the Mass at Geddes Hall on the University of Notre Dame campus was part of a larger event featuring a lecture on deaf Catholic history. And for more pictures, click here. In recent weeks, much ink has been spilled over Cardinal Sarah’s speech encouraging all priests to celebrate Mass ad orientem and the Vatican’s clarification note that followed. Numerous opinion pieces have appeared supporting either side of the issue or the co-existence of both in support of liturgical diversity. 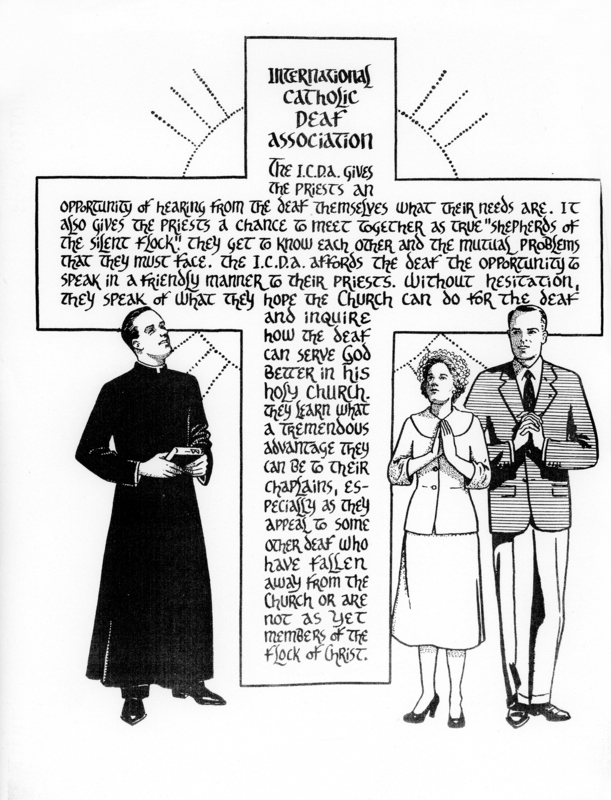 In view of what has been discussed, I do not wish to critique or rehash the arguments for and against ad orientem worship, but would like to offer an alternative perspective is seldom considered – that of the Deaf who use American Sign Language (ASL) in worship and those with special needs such as auditory processing (the hearing version of dyslexia) or speech and language impairments. Fr. Cyril Axelrod, the world’s only deafblind Catholic priest, who is currently authoring a catechism for disabled people for the Vatican, and yours truly, beaming because of Fr. Cyril’s warmth and unstoppable communication skills. Word & Sign has been in hibernation for too long, but I promise it’s been time well spent. This summer marks the beginning of my sabbatical, granted specifically to complete the first full draft of my book on Deaf language and culture in Catholic preaching. Already I’ve gotten a great head start. I’ve embraced a new organizing principle (200 years of evangelization and enculturation in the Deaf Catholic world), revamped my table of contents accordingly, and re-drafted four of the eighteen chapters I have planned. But the most exciting part of my sabbatical so far has been my research trip to the U.K. and Ireland. Later in Manchenster, thanks to Terry and Mary O’Meara, I stayed in the home of the charming Sisters of Charity of Evron and collected oral and signed history about their half-century of Deaf ministry in Britain and Ireland. I interviewed Archbishop Patrick Kelly about the Eucharistic prayer in British Sign Language! And in Dublin I viewed a 170-year-old Irish Sign Language manuscript, translated into English from French by the Dominican Sisters who founded St. Mary’s School for Deaf Girls in Cabra, Ireland. Now, St. Thomas and St. Catherine of Sienna, come aid this feeble brain as I try to map the daunting and richly diverse mountains of material I’ve collected into one coherent story of a people’s religious history!